. The Summit underscored the urgency of the threat of climate change by mobilizing the voices and experience of real people, in real communities already facing real and stark threats. 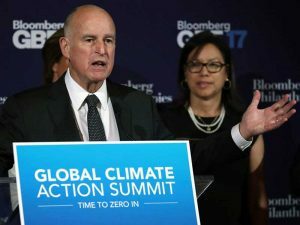 At the Summit, international and local leaders from states, regions, cities, businesses, investors and civil society—known as “non-party stakeholders/non-state actors”—were joined by national government leaders, scientists, students, nonprofits and others in a new wave of mobilization. They shared what they have achieved to date and committing to doing more to usher in the era of decarbonization, greater levels of sustainability and prosperity for the many rather than the few. 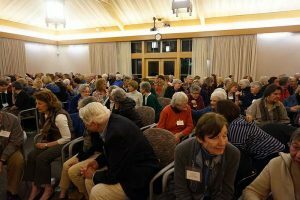 The Dominican Sisters of San Rafael have consciously and actively paid attention to the health and well-being of our planet for at least 40 years. We saw an opportunity to align with the Action Summit. Sister Carla Kovack, who coordinates our Gather@Grand speaker series, now in its fourth year, was inspired to action. On three successive Mondays in September, we offered Care for Our Common Home: A Film Series. We promoted the series to our regular attendees, and reached out locally with newspaper advertising to invite newcomers. After each film, there was a brief time of discussion about what we all learned, how we felt about it, and what changes we were inspired to make in our day-to-day lives. Happening: A Clean Energy Revolution with James Redford. This film explores the advantages and disadvantages of many forms of energy including, coal, solar, wind, water and nuclear. Redford travels across the country, speaking with innovators and advocates of a clean energy economy. We also learned that James lives in our own county! Before the Flood – presented by National Geographic, featuring Leonardo DiCaprio. As the United Nations Messenger of Peace, DiCaprio travels to five continents and the Arctic to see climate change in person. He discovers a campaign of disinformation run by special interest groups intending to confuse the public about the urgency of the growing climate crisis. Racing Extinction – Academy-award winning documentary by Louie Psihoyos wants to affect how we understand endangered species and mass extinctions, and the role of humans in what is happening. Hear scientists, engineers, artists and environmentalists talk about the issue and its urgency. If you haven’t seen these films yet, they are easily available on DVD. We are Dominicans, preaching the good news of a loving Creator, and teaching how to be responsible stewards of the gifts we have been given. We endorsed the Earth Charter in 2006, and have a standing Implementation Committee that engages all of us in studying and acting for the good of our planet and all of its inhabitants. We welcomed the publication of Pope Francis’ Laudato Sí three years ago, and we continue to find creative ways to share its message publicly.